Note: Todays workout was created in early 2009 by CrossFit Football Founder and good friend to Greg Amundson, former NFL player John Welborne. This workout was the Football version of the famous workout known as “Fight Gone Bad” which was created for UFC Fighters. The key to success in this workout is fast, powerful and accurate repetitions at each station. Rob is Athlete Of The Week! Congratulations to Rob who was recognized as Athlete Of The Week at CrossFit Amundson. The picture above perfectly captures the heart of Rob – a true warrior, family man, and life dedicated to public service. Rob has been training extremely hard and consistently, and the results have been awesome to behold. 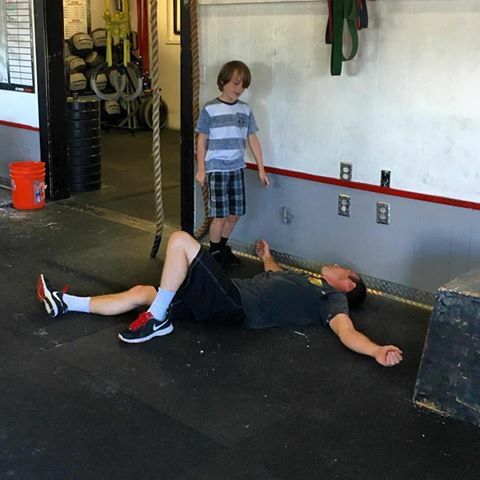 Rob’s progress in weightlifting, specifically his Push Jerk, has been noteworthy, and according to Rob, “I finally got it!” Rob is super encouraging of his fellow Athletes, and when the going gets tough, you can count on hearing Rob’s voice of motivation. When Rob is not crushing workouts at the gym, he is either with his family, or protecting his community as a Firefighter. Congratulations Rob on all your success, and keep up the great work!